For the American politician, see Michael Shoemaker. For the Luxembourgian athlete, see Mike Schumacher. Michael Schumacher (/ˈʃuːˌmɑːkər/; German: [ˈmɪçaːʔeːl ˈʃuːmaxɐ] ( listen); born 3 January 1969) is a retired German racing driver who raced in Formula One for Jordan Grand Prix, Benetton and Ferrari, where he spent most of his career, as well as for Mercedes upon his return to the sport. Widely regarded as one of the greatest Formula One drivers ever, and regarded by some as the greatest of all time, Schumacher is the only driver in history to win seven Formula One World Championships, five of which he won consecutively. The most successful driver in the history of the sport, Schumacher holds the records for the most World Championship titles (7), the most Grand Prix wins (91), the most fastest laps (77) and the most races won in a single season (13), and according to the official Formula One website (Formula1.com), Schumacher was "statistically the greatest driver the sport has ever seen" at the time of his retirement from the sport. After success in karting as a child, Schumacher won titles in Formula König and Formula Three before joining Mercedes in the World Sportscar Championship. In 1991, his Mercedes-funded race debut for the Jordan Formula One team resulted in Schumacher being signed by Benetton for the rest of that season. He finished third in 1992 and fourth in 1993, before becoming the first German World Drivers' Champion in 1994 by one point over Damon Hill, albeit in controversial circumstances. In 1995 he repeated the success, this time with a greater margin. In 1996, Schumacher moved to Ferrari, who had last won the Drivers' Championship in 1979, and helped them transform into the most successful team in Formula One history, as he came close to winning the 1997 and 1998 titles, before breaking his leg at the 1999 British Grand Prix, ending another title run. Schumacher won five consecutive drivers' titles from 2000 to 2004, including an unprecedented sixth and seventh title. In 2002, Schumacher won the title with a record six races remaining and finished on the podium in every race. In 2004, Schumacher won twelve out of the first thirteen races and went on to win a record 13 times as he won his final title. Schumacher retired from Formula One in 2006, after finishing runner-up to Renault's Fernando Alonso. Schumacher returned to Formula One in 2010 with Mercedes. He produced the fastest qualifying time at the 2012 Monaco Grand Prix, and achieved his only podium on his return at the 2012 European Grand Prix, where he finished third. In October 2012, Schumacher announced he would retire for a second time at the end of the season. His career was frequently controversial, as he was twice involved in collisions in the final race of a season that determined the outcome of the World Championship, with Damon Hill in 1994 in Adelaide, and with Jacques Villeneuve in 1997 in Jerez. Schumacher is an ambassador for UNESCO and has been involved in numerous humanitarian efforts throughout his life, donating tens of millions of dollars to charity. Schumacher and his younger brother, Ralf, are the only siblings to win races in Formula One, and they were the first brothers to finish 1st and 2nd in the same race, a feat they repeated in four subsequent races. On 29 December 2013, Schumacher suffered a traumatic brain injury in a skiing accident. He was placed in a medically induced coma for six months until 16 June 2014. He left the hospital in Grenoble for further rehabilitation at the University Hospital of Lausanne. On 9 September 2014, Schumacher was relocated to his home where he continues to receive medical treatment and rehabilitation privately. As of 2016 he remained unable to walk or stand. Schumacher was born in Hürth, North Rhine-Westphalia, to Rolf Schumacher, a bricklayer, and his wife Elisabeth. When Schumacher was four, his father modified his pedal kart by adding a small motorcycle engine. When Schumacher crashed it into a lamp post in Kerpen, his parents took him to the karting track at Kerpen-Horrem, where he became the youngest member of the karting club. His father soon built him a kart from discarded parts and at the age of six Schumacher won his first club championship. To support his son's racing, Rolf Schumacher took on a second job renting and repairing karts, while his wife worked at the track's canteen. Nevertheless, when Michael needed a new engine costing 800 DM, his parents were unable to afford it; he was able to continue racing with support from local businessmen. Regulations in Germany require a driver to be at least fourteen years old to obtain a kart license. To get around this, Schumacher obtained a license in Luxembourg at the age of 12. In 1983, he obtained his German license, a year after he won the German Junior Kart Championship. From 1984 on, Schumacher won many German and European kart championships. He joined Eurokart dealer Adolf Neubert in 1985 and by 1987 he was the German and European kart champion, then he quit school and began working as a mechanic. In 1988 he made his first step into single-seat car racing by participating in the German Formula Ford and Formula König series, winning the latter. In 1989, Schumacher signed with Willi Weber's WTS Formula Three team. Funded by Weber, he competed in the German Formula 3 series, winning the title in 1990. He also won the Macau Grand Prix. At the end of 1990, along with his Formula 3 rivals Heinz-Harald Frentzen and Karl Wendlinger, he joined the Mercedes junior racing programme in the World Sports-Prototype Championship. This was unusual for a young driver: most of Schumacher's contemporaries would compete in Formula 3000 on the way to Formula One. However, Weber advised Schumacher that being exposed to professional press conferences and driving powerful cars in long distance races would help his career. In the 1990 World Sportscar Championship season, Schumacher won the season finale at the Autódromo Hermanos Rodríguez in a Sauber–Mercedes C11, and finished fifth in the drivers' championship despite only driving in three of the nine races. He continued with the team in the 1991 World Sportscar Championship season, winning again at the final race of the season at Autopolis in Japan with a Sauber–Mercedes-Benz C291, leading to a ninth-place finish in the drivers' championship. He also competed at Le Mans during that season, finishing 5th in a car shared with Karl Wendlinger and Fritz Kreutzpointner. In 1991, he competed in one race in the Japanese Formula 3000 Championship, finishing second. Schumacher was noted throughout his career for his ability to produce fast laps at crucial moments in a race and to push his car to the very limit for sustained periods. Motor sport author Christopher Hilton observed in 2003 that a "measure of a driver's capabilities is his performance in wet races, because the most delicate car control and sensitivity are needed", and noted that like other great drivers, Schumacher's record in wet conditions shows very few mistakes: up to the end of the 2003 season, Schumacher won 17 of the 30 races in wet conditions he contested. Some of Schumacher's best performances occurred in such conditions, earning him the nicknames "Regenkönig" (rain king) or "Regenmeister" (rain master), even in the non-German-language media. He is known as "the Red Baron", because of his red Ferrari and in reference to the German Manfred von Richthofen, the famous flying ace of World War I. Schumacher's nicknames include "Schumi", "Schuey" and "Schu". Schumacher is often credited with popularising Formula One in Germany, where it was formerly considered a fringe sport. When Schumacher retired in 2006, three of the top ten drivers were German, more than any other nationality and more than have ever been present in Formula One history. Younger German drivers, such as Sebastian Vettel, felt Schumacher was key in their becoming Formula One drivers. In the latter part of his Formula One career, and as one of the senior drivers, Schumacher was the president of the Grand Prix Drivers' Association. In a 2006 FIA survey, Michael Schumacher was voted the most popular driver of the season among Formula One fans. Schumacher made his Formula One debut with the Jordan-Ford team at the 1991 Belgian Grand Prix, driving car number 32 as a replacement for the imprisoned Bertrand Gachot. Schumacher, still a contracted Mercedes driver, was signed by Eddie Jordan after Mercedes paid Jordan $150,000 for his debut. The week before the race, Schumacher impressed Jordan designer Gary Anderson and team manager Trevor Foster during a test drive at Silverstone. His manager Willi Weber assured Jordan that Schumacher knew the challenging Spa track well, although in fact he had only seen it as a spectator. During the race weekend, teammate Andrea de Cesaris was meant to show Schumacher the circuit, but was held up with contract negotiations. Schumacher then learned the track on his own, by cycling around the track on a fold-up bike he had brought with him. He impressed the paddock by qualifying seventh in this race. This matched the team's season-best grid position, and out-qualified 11-year veteran de Cesaris. Motorsport journalist Joe Saward reported that after qualifying "clumps of German journalists were talking about 'the best talent since Stefan Bellof'". Schumacher retired on the first lap of the race with clutch problems. Following his Belgian Grand Prix debut, and despite an agreement in principle between Jordan and Schumacher's Mercedes management that would see the German race for the Irish team for the remainder of the season, Schumacher was engaged by Benetton-Ford for the following race. Jordan applied for an injunction in the UK courts to prevent Schumacher driving for Benetton, but lost the case as they had not yet signed a final contract. Schumacher finished the 1991 season with four points out of six races. His best finish was fifth in his second race, the Italian Grand Prix, in which he finished ahead of his team-mate and three-time World Champion Nelson Piquet. At the start of the 1992 season the Sauber team, planning their Formula One debut with Mercedes backing for the following year, invoked a clause in Schumacher's contract that stated that if Mercedes entered Formula One, Schumacher would drive for them. It was eventually agreed that Schumacher would stay with Benetton, Peter Sauber said that "[Schumacher] didn't want to drive for us. Why would I have forced him?". The year was dominated by the Williams of Nigel Mansell and Riccardo Patrese, featuring powerful Renault engines, semi-automatic gearboxes and active suspension to control the car's ride height. In the "conventional" Benetton B192 Schumacher took his place on the podium for the first time, finishing third in the Mexican Grand Prix. He went on to take his first victory at the Belgian Grand Prix, in a wet race at the Spa-Francorchamps circuit, which by 2003 he would call "far and away my favourite track". He finished third in the Drivers' Championship in 1992 with 53 points, three points behind runner-up Patrese. The Williams of Damon Hill and Alain Prost also dominated the 1993 season. Benetton introduced their own active suspension and traction control early in the season, last of the frontrunning teams to do so. Schumacher won one race, the Portuguese Grand Prix where he beat Prost, and had nine podium finishes, but retired in seven of the other 15 races. He finished the season in fourth, with 52 points. The 1994 season was Schumacher's first Drivers' Championship. The season, however, was marred by the deaths of Ayrton Senna (witnessed by Schumacher, who was directly behind in 2nd position) and Roland Ratzenberger during the San Marino Grand Prix, and by allegations that several teams, but most particularly Schumacher's Benetton team, broke the sport's technical regulations. Schumacher won six of the first seven races and was leading the Spanish Grand Prix, before a gearbox failure left him stuck in fifth gear. Schumacher finished the race in second place. Following the San Marino Grand Prix, the Benetton, Ferrari and McLaren teams were investigated on suspicion of breaking the FIA-imposed ban on electronic aids. Benetton and McLaren initially refused to hand over their source code for investigation. When they did so, the FIA discovered hidden functionality in both teams' software, but no evidence that it had been used in a race. Both teams were fined $100,000 for their initial refusal to cooperate. However, the McLaren software, which was a gearbox program that allowed automatic shifts, was deemed legal. By contrast, the Benetton software was deemed to be a form of "launch control" that would have allowed Schumacher to make perfect starts, which was explicitly outlawed by the regulations. However, there was no evidence to suggest that this software was actually used. At the British Grand Prix, Schumacher was penalised for overtaking on the formation lap. He then ignored the penalty and the subsequent black flag, which indicates that the driver must immediately return to the pits, for which he was disqualified and later given a two-race ban. Benetton blamed the incident on a communication error between the stewards and the team. Schumacher was also disqualified after winning the Belgian Grand Prix after his car was found to have illegal wear on its skidblock, a measure used after the accidents at Imola to limit downforce and hence cornering speed. Benetton protested that the skidblock had been damaged when Schumacher spun over a kerb, but the FIA rejected their appeal because of the pattern of wear and damage visible on the block. These incidents helped Damon Hill close the points gap, and Schumacher led by a single point going into the final race in Australia. On lap 36 Schumacher hit the guardrail on the outside of the track while leading. Hill attempted to pass, but as Schumacher's car returned to the track there was a collision on the corner causing them both to retire. As a result, Schumacher won a very controversial championship, the first German to do so (Jochen Rindt raced under the Austrian flag). At the FIA conference after the race, the new World Champion dedicated his title to Ayrton Senna. In 1995 Schumacher successfully defended his title with Benetton. He now had the same Renault engine as Williams. He accumulated 33 more points than second-placed Damon Hill. With teammate Johnny Herbert, he took Benetton to its first Constructors' Championship and became the youngest two-time World Champion in Formula One history. The season was marred by several collisions with Hill, in particular an overtaking manoeuvre by Hill took them both out of the British Grand Prix on lap 45, and again on lap 23 of the Italian Grand Prix. Schumacher won nine of the 17 races, and finished on the podium 11 times. Only once did he qualify worse than fourth; at the Belgian Grand Prix, he qualified 16th, but nevertheless went on to win the race. In 1996, Schumacher joined Ferrari, a team that had last won the Drivers' Championship in 1979 and the Constructors' Championship in 1983, for a salary of $60 million over 2 years. He left Benetton a year before his contract with them expired; he later cited the team's damaging actions in 1994 as his reason for opting out of his deal. A year later Benetton employees Rory Byrne (designer) and Ross Brawn (Technical Director) joined Ferrari. Ferrari had previously come close to the championship in 1982 and 1990. The team had suffered a disastrous downturn in the early 1990s, partially as its famous V12 engine was no longer competitive against the smaller, lighter and more fuel efficient V10s of its competitors. Various drivers, notably Alain Prost, had given the vehicles labels such as "truck", "pig", and "accident waiting to happen". Furthermore, the poor performance of the Ferrari pit crews was considered a running joke. At the end of 1995, though the team had improved into a solid competitor, it was still considered inferior to front-running teams such as Benetton and Williams. Schumacher declared the Ferrari 412T good enough to win the Championship. Schumacher, Ross Brawn, Rory Byrne, and Jean Todt (hired in 1993), have been credited as turning this once struggling team into the most successful team in Formula One history. Three-time World Champion Jackie Stewart believes the transformation of the Ferrari team was Schumacher's greatest feat. Eddie Irvine also joined the team, moving from Jordan. During winter testing, Schumacher first drove a Ferrari, their 1995 Ferrari 412 T2, and was two seconds faster than former regulars Jean Alesi and Gerhard Berger had been. "It was not a race. It was a demonstration of brilliance." Schumacher finished third in the Drivers' Championship in 1996 and helped Ferrari to second place in the Constructors' Championship ahead of his old team Benetton. He won three races, more than the team's total tally for the period from 1991 to 1995. Early in the 1996 season the car had reliability trouble and Schumacher did not finish six of the 16 races. He took his first win for Ferrari at the Spanish Grand Prix, where he lapped the entire field up to third place in the wet. Having taken the lead on lap 19, he consistently lapped five seconds faster than the rest of the field in the difficult conditions. In the French Grand Prix Schumacher qualified in pole position, but suffered engine failure on the race's formation lap. However at Spa-Francorchamps, Schumacher used well-timed pit-stops to fend off Williams's Jacques Villeneuve. 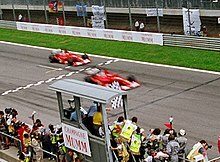 Following that, at Monza, Schumacher won in front of the tifosi. Michael Schumacher and Jacques Villeneuve vied for the title in 1997. Villeneuve, driving the superior Williams FW19, led the championship in the early part of the season. However, by mid-season, Schumacher had taken the championship lead, winning five races, and entered the season's final Grand Prix with a one-point advantage. Towards the end of the race, held at Jerez, Schumacher's Ferrari developed a coolant leak and loss of performance indicating he may not finish the race. As Villeneuve approached to pass his rival, Schumacher attempted to provoke an accident, but got the short end of the stick, retiring from the race. Villeneuve went on and scored four points to take the championship. Schumacher was punished for unsportsmanlike conduct for the collision and was disqualified from the Drivers' Championship. In 1998, Finnish driver Mika Häkkinen became Schumacher's main title competition. Häkkinen won the first two races of the season, gaining a 16-point advantage over Schumacher. Schumacher then won in Argentina and, with the Ferrari improving significantly in the second half of the season, Schumacher took six victories and had five other podium finishes. Ferrari took a 1–2 finish at the French Grand Prix, the first Ferrari 1–2 finish since 1990, and the Italian Grand Prix, which tied Schumacher with Häkkinen for the lead of the Drivers' Championship with 80 points, but Häkkinen won the Championship by winning the final two races. There were two controversies; at the British Grand Prix Schumacher was leading on the last lap when he turned into the pit lane, crossed the start finish line and stopped for a ten-second stop go penalty. There was some doubt whether this counted as serving the penalty, but, because he had crossed the finish line when he came into the pit lane, the win was valid. At Spa, Schumacher was leading the race by 40 seconds in heavy spray, but collided with David Coulthard's McLaren when the Scot, a lap down, slowed in very poor visibility to let Schumacher past. After both cars returned to the pits, Schumacher leaped out of his car and headed to McLaren's garage in an infuriated manner and accused Coulthard of trying to kill him. Coulthard admitted five years later that the accident had been his mistake. Schumacher's efforts helped Ferrari win the Constructors title in 1999. He lost his chance to win the Drivers' Championship at the British Grand Prix at the high-speed Stowe Corner, his car's rear brake failed, sending him off the track and resulting in a broken leg. During his 98-day absence, he was replaced by Finnish driver Mika Salo. After missing six races he made his return at the inaugural Malaysian Grand Prix, qualifying in pole position by almost a second. He then assumed the role of second driver, assisting teammate Eddie Irvine's bid to win the Drivers' Championship for Ferrari. In the last race of the season, the Japanese Grand Prix, Häkkinen won his second consecutive title. Schumacher would later say that Häkkinen was the opponent he respected the most. Schumacher won his fourth World title in 2001. During this period Schumacher won more races and championships than any other driver in the history of the sport. Schumacher won his third World Championship in 2000 after a year-long battle with Häkkinen. Schumacher won the first three races of the season and five of the first eight. Midway through the year, Schumacher's chances suffered with three consecutive non-finishes, allowing Häkkinen to close the gap in the standings. Häkkinen then took another two victories, before Schumacher won at the Italian Grand Prix. At the post race press conference, after equalling the number of wins (41) won by his idol, Ayrton Senna, Schumacher broke into tears. The championship fight would come down to the penultimate race of the season, the Japanese Grand Prix. Starting from pole position, Schumacher lost the lead to Häkkinen at the start. After his second pit-stop, however, Schumacher came out ahead of Häkkinen and went on to win the race and the championship. In 2001, Schumacher took his fourth drivers' title. Four other drivers won races, but none sustained a season-long challenge for the championship. Schumacher scored a record-tying nine wins and clinched the World Championship with four races yet to run. He finished the championship with 123 points, 58 ahead of runner-up Coulthard. Season highlights included the Canadian Grand Prix, where Schumacher finished 2nd to his brother Ralf, thus scoring the first ever 1–2 finish by brothers in Formula One; and the Belgian Grand Prix in which Schumacher scored his 52nd career win, breaking Alain Prost's record for most career wins. In 2002, Schumacher used the Ferrari F2002 to retain his Drivers' Championship. There was again some controversy, however, at the Austrian Grand Prix, where his teammate, Rubens Barrichello was leading, but in the final metres of the race, under team orders, slowed down to allow Schumacher to win the race. The crowd broke into outraged boos at the result and Schumacher tried to make amends by allowing Barrichello to stand on the top step of the podium. At the United States Grand Prix later that year, Schumacher dominated the race and was set for a close finish with Barrichello. At the end he slowed down to create a formation finish with Barrichello, but slowed too much allowing Barrichello to take the victory. In winning the Drivers' Championship he equalled the record set by Juan Manuel Fangio of five World Championships. Ferrari won 15 out of 17 races, and Schumacher won the title with six races remaining in the season, which is still the earliest point in the season for a driver to be crowned World Champion. Schumacher broke his own record, shared with Nigel Mansell, of nine race wins in a season, by winning eleven times and finishing every race on the podium. He finished with 144 points, a record-breaking 67 points ahead of the runner-up, his teammate Rubens Barrichello. This pair finished nine of the 17 races in the first two places. Schumacher broke Juan Manuel Fangio's record of five World Drivers' Championships by winning the drivers' title for the sixth time in 2003, a closely contested season. The biggest competition came once again from the McLaren Mercedes and Williams BMW teams. 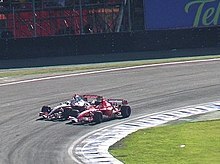 In the first race, Schumacher ran off track, and in the following two, was involved in collisions. He fell 16 points behind Kimi Räikkönen. Schumacher won the San Marino Grand Prix and the next two races, and closed within two points of Räikkönen. Aside from Schumacher's victory in Canada, and Barrichello's victory in Britain, the mid-season was dominated by Williams drivers Ralf Schumacher and Juan Pablo Montoya, who each claimed two victories. After the Hungarian Grand Prix, Michael Schumacher led Montoya and Kimi Räikkönen by only one and two points, respectively. Ahead of the next race, the FIA announced changes to the way tyre widths were to be measured: this forced Michelin, supplier to Williams and McLaren among others, to rapidly redesign their tyres before the Italian Grand Prix. Schumacher, running on Bridgestone tyres, won the next two races. After Montoya was penalised in the United States Grand Prix, only Schumacher and Räikkönen remained in contention for the title. At the final round, the Japanese Grand Prix, Schumacher needed only one point whilst Räikkönen needed to win. By finishing the race in eighth place, Schumacher took one point and assured his sixth World Drivers' title, ending the season two points ahead of Räikkönen. In 2004, Schumacher won a record twelve of the first thirteen races of the season, only failing to finish in Monaco after an accident with Juan Pablo Montoya during a safety car period when he briefly locked his car's brakes. He clinched a record seventh drivers' title at the Belgian Grand Prix. He finished that season with a record 148 points, 34 points ahead of the runner-up, teammate Rubens Barrichello, and set a new record of 13 race wins out of a possible 18, surpassing his previous best of 11 wins from the 2002 season. Rule changes for the 2005 season required tyres to last an entire race, tipping the overall advantage to teams using Michelins over teams such as Ferrari that relied on Bridgestone tyres. The rule changes were partly in an effort to dent Ferrari's dominance and make the series more interesting. The most notable moment of the early season for Schumacher was his battle with Fernando Alonso in San Marino, where he started 13th and finished only 0.2 seconds behind the Spanish driver. Less than halfway through the season, Schumacher said "I don't think I can count myself in this battle any more. It was like trying to fight with a blunted weapon.... If your weapons are weak you don't have a chance." Schumacher's sole win in 2005 came at the United States Grand Prix. Before that race, the Michelin tyres were found to have significant safety issues. When no compromise between the teams and the FIA could be reached, all but the six drivers using Bridgestone tyres dropped out of the race after the formation lap. Schumacher retired in six of the 19 races. He finished the season in third with 62 points, fewer than half the points of World Champion Alonso. 2006 became the last season of Schumacher's Ferrari career. After three races, Schumacher had just 11 points and was already 17 points behind Alonso. He won the following two races. His pole position at San Marino was his 66th, breaking Ayrton Senna's 12-year-old record. Schumacher was stripped of pole position at the Monaco Grand Prix and started the race at the back of the grid. This was due to his stopping his car and blocking part of the circuit while Alonso was on his qualifying lap; he still managed to work his way up to 5th place on the notoriously cramped Monaco circuit. By the Canadian Grand Prix, the ninth race of the season, Schumacher was 25 points behind Alonso, but he then won the following three races to reduce his disadvantage to 11. After his victories in Italy (in which Alonso had an engine failure) and China, in which Alonso had tyre problems, Schumacher led in the championship standings for the first time during the season. Although he and Alonso had the same point total, Schumacher was in front because he had won more races. The Japanese Grand Prix was led by Schumacher with only 16 laps to go, when, for the first time since the 2000 French Grand Prix, Schumacher's car suffered an engine failure. Alonso won the race, giving himself a ten-point championship lead. With only one race left in the season, Schumacher could only win the championship if he won the season finale and Alonso scored no points. Before the Brazilian Grand Prix, Schumacher conceded the title to Alonso. In pre-race ceremonies, football legend Pelé presented a trophy to Schumacher for his years of dedication to Formula One. During the race's qualifying session, Schumacher had one of the quickest times during the first session and was fastest in the second session; but a fuel pressure problem prevented him from completing a single lap during the third session, forcing him to start the race in tenth position. Early in the race Schumacher moved up to sixth place. However, in overtaking Alonso's teammate, Giancarlo Fisichella, Schumacher experienced a tyre puncture caused by the front wing of Fisichella's car. Schumacher pitted and consequently fell to 19th place, 70 seconds behind teammate and race leader Felipe Massa. Schumacher recovered and overtook both Fisichella and Räikkönen to secure fourth place. His performance was classified in the press as "heroic", an "utterly breath-taking drive", and a "performance that ... sums up his career". While Schumacher was on the podium after winning the 2006 Italian Grand Prix, Ferrari issued a press release stating that he would retire from racing at the end of the 2006 season. Schumacher confirmed his retirement. The press release stated that Schumacher would continue working for Ferrari. It was revealed on 29 October 2006 that Ferrari wanted Schumacher to act as assistant to the newly appointed CEO Jean Todt. This would involve selecting the team's future drivers. After Schumacher's announcement, leading Formula One figures such as Niki Lauda and David Coulthard hailed Schumacher as the greatest all-round racing driver in the history of Formula One. The tifosi and the Italian press, who did not always take to Schumacher's relatively cold public persona, displayed an affectionate response after he announced his retirement. He attended several Grands Prix during the season. Schumacher drove the Ferrari F2007 for the first time on 24 October at Ferrari's home track in Fiorano, Italy. He ran no more than five laps and no lap times were recorded. A Ferrari spokesman said the short drive was done for the Fiat board of directors who were holding their meeting in Maranello. During the 2007 season Schumacher acted as Ferrari's adviser and Jean Todt's 'super assistant'. On 13 November 2007 Schumacher, who had not driven a Formula One car since he had retired a year earlier, undertook a formal test session for the first time aboard the F2007. He returned in December 2007 to continue helping Ferrari with their development programme at Jerez circuit. He focused on testing electronics and tyres for the 2008 Formula One season. In 2007, former Ferrari top manager Ross Brawn said that Schumacher was very likely and also happy to continue testing in 2008; Schumacher later explained his role further saying that he would "deal with the development of the car inside Gestione Sportiva" and as part of that "I'd like to drive, but not too often". During 2008 Schumacher also competed in motorcycle racing in the IDM Superbike-series, but stated that he had no intention of a second competitive career in this sport. He was quoted as saying that riding a Ducati was the most exhilarating thing he had done in his life, the second most being sky diving. In his capacity as racing advisor to Ferrari, Schumacher was present in Budapest for the Hungarian Grand Prix when Ferrari driver Felipe Massa was seriously injured after being struck by a suspension spring during qualifying. As it became clear that Massa would be unable to compete in the next race at Valencia, Schumacher was chosen as a replacement for the Brazilian driver and on 29 July 2009, Ferrari announced that they planned to draft in Schumacher for the European Grand Prix and subsequent Grands Prix until Massa was able to race again. Schumacher tested in a modified F2007 to prepare himself as he had been unable to test the 2009 car due to testing restrictions. Ferrari appealed for special permission for Schumacher to test in a 2009 spec car, but Williams, Red Bull and Toro Rosso were against this test. In the end, Schumacher was forced to call off his return due to the severity of the neck injury he had received in a motorcycle accident earlier in the year. Massa's place at Ferrari was instead filled by Luca Badoer and Giancarlo Fisichella. In December 2009 it was announced that Schumacher would be returning to Formula One in the 2010 season alongside fellow German driver Nico Rosberg in the new Mercedes GP team. The new Mercedes team was their first majority involvement in an F1 team since 1955. Schumacher stated that his preparations to replace the injured Massa for Ferrari had initiated a renewed interest in F1, which, combined with the opportunity to fulfil a long-held ambition to drive for Mercedes and to be working again with team principal Ross Brawn, led Schumacher to accept the offer once he was passed fit. After a period of intensive training medical tests, it was confirmed that the neck injury that had prevented him driving for Ferrari the year before had fully healed. Schumacher signed a three-year contract, reportedly worth £20m. Schumacher's surprise return to F1 was compared to Niki Lauda's in 1982 aged 33 and Nigel Mansell's return in 1994 at age 41. Schumacher turned 41 in January 2010 and his prospects with Mercedes were compared with the record set by the oldest F1 champion Juan Manuel Fangio who was 46 when he won his fifth championship. Schumacher's first drive of the 2010 Mercedes car – the Mercedes MGP W01 – was at an official test in February 2010 in Valencia. He finished sixth in the first race of the season at the Bahrain Grand Prix. After the Malaysian race, former driver Stirling Moss suggested that Schumacher, who had finished behind his teammate in each of the first four qualifying sessions and races, might be "past it". Many other respected former Formula One drivers thought otherwise, including former rival Damon Hill, who warned "you should never write Schumacher off". GrandPrix.com identified the inherent understeer of the Mercedes car, exacerbated by the narrower front tyres introduced for the 2010 season, as contributing to Schumacher's difficulties. Jenson Button would later claim that Mercedes's 2010 car was designed for him, and that their differing driving styles may have contributed to Schumacher's difficulties. Mercedes upgraded their car for the Spanish Grand Prix where Schumacher finished fourth. At the Monaco Grand Prix Schumacher finished sixth after passing Ferrari's Fernando Alonso on the final corner of the race when the safety car returned to the pits. However, he was penalised 20 seconds after the race by the race stewards dropping him to 12th. The stewards judged the pass to be in breach of the FIA's sporting code. Mercedes's differing interpretation of the regulation would later lead to it being clarified by the FIA. Schumacher's 2010 season ended with a first lap crash at the Abu Dhabi Grand Prix. In Turkey, Schumacher qualified fifth, and finished fourth in the race, both his best results since his return. In European Grand Prix in Valencia, Schumacher finished 15th, the lowest recorded finish in his career. In Hungary, Schumacher finished outside the points in eleventh, but was found guilty of dangerous driving at 180 mph (290 km/h) while unsuccessfully defending tenth position against Rubens Barrichello. As a result, he was demoted ten places on the grid for the following race, the Belgian Grand Prix, where he finished seventh, despite starting 21st after his grid penalty. At the season finale in Abu Dhabi, Schumacher was involved in a major accident on the first lap, which occurred after a spin. In recovering from the incident Vitantonio Liuzzi's car collided with Schumacher, barely missing his head. Nobody was hurt in the crash, but Schumacher said the crash had been "frightening". He finished the season 9th with 72 points. Before, it had happened only in his début in 1991 that he finished without a win, pole position, podium or fastest lap. Schumacher's first points of 2011 were scored in Malaysia, he later came sixth in Spain and had a strong race at the Canadian Grand Prix finishing fourth, after running as high as second in a wet race. Schumacher was passed late in the race by eventual winner Jenson Button. Schumacher finished fourth in the Canadian Grand Prix. Schumacher clashed with Vitaly Petrov in Valencia, and with Kamui Kobayashi in Britain, and marked the 20th anniversary of his Formula One début at the Belgian Grand Prix. Despite starting last in Belgium, Schumacher raced well and finished fifth. Schumacher again raced well in Italy, duelling with Lewis Hamilton for fourth place. The Japanese Grand Prix saw Schumacher lead three laps during the race, marking the first time he had led a race since 2006. In doing so, he became the oldest driver to lead a race since Jack Brabham in 1970. At the Indian Grand Prix Schumacher started well and finished fifth after overtaking Rosberg at the end of the race. Schumacher diced again with Rosberg in Abu Dhabi Grand Prix, battling over sixth position on the first lap. Schumacher finished the season in eighth place in the Drivers' Championship, with 76 points. Schumacher climbs out of his car after spinning off during the final practice session at the Australian Grand Prix. He retired from the race with gearbox problems. Schumacher was again partnered by Rosberg at Mercedes for the 2012 season. Schumacher retired from the inaugural race of the season Australian Grand Prix, and scored a point in the second race in Malaysia. In China Schumacher started on the front row alongside Rosberg on pole, but retired due to a loose wheel after a mechanic's error during a pit stop. After causing a collision with Bruno Senna in Spain, Schumacher received a five-place grid penalty for the Monaco Grand Prix. Schumacher was fastest in qualifying in Monaco; but started sixth owing to his penalty. He later retired from seventh place in the race. Schumacher qualified fastest at the 2012 Monaco Grand Prix. At the European Grand Prix, Schumacher finished third in the race, his only podium finish since his return to F1 with Mercedes. At the age of 43 years and 173 days, he became the oldest driver to achieve a podium since Jack Brabham's second-place finish at the 1970 British Grand Prix. Further records were set by Schumacher in Germany, where he set the fastest lap in a Grand Prix for the 77th time in his career, and in Belgium where he became the second driver in history to race in 300 Grands Prix. Schumacher's indecision over his future plans in F1 led to him being replaced by Lewis Hamilton at Mercedes for the 2013 season. In October 2012, Schumacher announced he would retire for a second time at the conclusion of the season. The following week he was quoted as saying: "There were times in the past few months in which I didn't want to deal with Formula One or prepare for the next Grand Prix." The season and his 21-year F1 career concluded with the 2012 Brazilian Grand Prix, in which Schumacher finished seventh. He placed 13th in the 2012 Drivers' Championship. Schumacher, in conjunction with Schuberth, helped develop the first lightweight carbon helmet. In 2004, a prototype was publicly tested by being driven over by a tank; it survived intact. The helmet keeps the driver cool by funneling directed airflow through fifty holes. 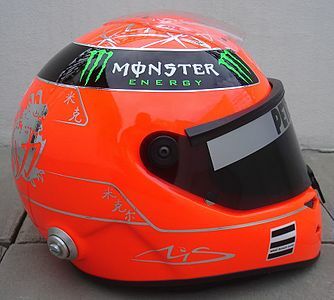 Schumacher's original helmet sported the colours of the German flag and his sponsor's decals. On the top was a blue circle with white astroids. From the 2000 Monaco Grand Prix, in order to differentiate his colours from his new teammate Rubens Barrichello, Schumacher changed the upper blue colour and some of the white areas to red. For the Brazilian Grand Prix race of 2006 (at the time intended to be his final Grand Prix), he wore an all-red helmet that included the names of his ninety-one Grand Prix victories. For the 2011 Belgian Grand Prix, Schumacher's 20th anniversary in Formula One, he wore a commemorative gold-leafed helmet. 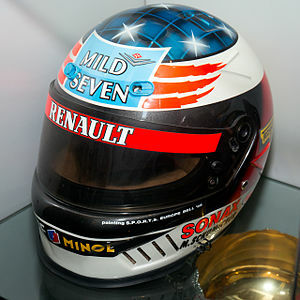 The helmet, very similar to his current helmet, included the year of his début to the present, and the years of his seven World titles. For the 2012 Belgian Grand Prix, Schumacher's 300th Grand Prix appearance, he wore a special platinum-leafed helmet with a message of his achievement. Helmet for the 1994 season (Benetton); Schumacher used the Bell helmet for 9 years in Formula One, from the 1992 Canadian Grand Prix to 2001 Australian Grand Prix. Bell helmet for the 1995 season (Benetton); Schumacher even kept using this white-coloured helmet after moving to Ferrari in 1996 until he switched its colour to red at the 2000 Monaco Grand Prix. Schuberth helmet for the 2002 season (Ferrari); At the 2001 Malaysian Grand Prix, Schumacher switched his helmet from Bell to Schuberth though there was a contract with Bell for the 2001 season. 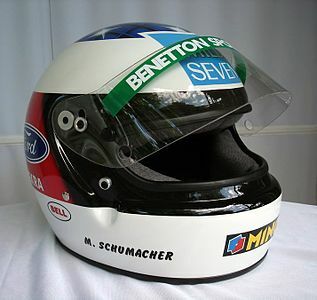 From the 2001 season, Schumacher continued to use the Schuberth helmet until his last race in Formula One. Schuberth helmet for the 2011 season (Mercedes GP); Schumacher kept using a red-coloured helmet at Silver Arrows. Chinese dragon illustration and a Chinese character "力" ("power") are inscribed on the back of the helmet. Turns 9–10 of the Nürburgring were renamed after Schumacher in 2007. Schumacher was honoured many times during his career. In April 2002, for his contributions to sport and his contributions in raising awareness of child education, he was named as one of the UNESCO Champions for sport, joining the other eight, which include Pelé, Sergey Bubka and Justine Henin. He won the Laureus World Sportsman of the Year award twice, in 2002 and 2004 for his performances in the 2001 and 2003 seasons respectively. He also received nominations for the 2001, 2003, 2005 and 2007 awards. He shares the record for having the second-most nominations for the award with Roger Federer with six nominations, and is eclipsed only by Tiger Woods who has been nominated seven times. He holds the distinction of having the most nominations for a motorsport athlete, (Fernando Alonso has been nominated only twice, Sebastian Vettel three times, and Valentino Rossi five times) and being the only motorsport athlete to have won the award more than once. In honour of Schumacher's racing career and his efforts to improve safety and the sport, he was awarded an FIA Gold Medal for Motor Sport in 2006. In 2007, in recognition of his contribution to Formula One racing, the Nürburgring racing track renamed turns 8 and 9 (the Audi and Shell Kurves) as the Schumacher S, and a month later he presented A1 Team Germany with the A1 World Cup at the A1GP World Cup of Motorsport 2007 awards ceremony. He was nominated for the Prince of Asturias Award for Sport for 2007, which he won both for sporting prowess and for his humanitarian record. In 2008, the Swiss Football Association appointed long-time Swiss resident Schumacher as the country's ambassador for the 2008 European football championship. On 30 April 2010, Schumacher was honored with the Officier of Légion d'honneur title from French prime minister François Fillon. On 13 November 2014, Schumacher was awarded the Millennium Trophy at the Bambi Awards. Going into the 1994 Australian Grand Prix, the final race of the 1994 season, Schumacher led Damon Hill by a single point in the Drivers' Championship. Schumacher led the race from the beginning, but on lap 35 he went off track and hit the wall with his right side wheels, returning to the track at reduced speed, and with car damage, but still leading the race. At the next corner Hill attempted to pass on the inside, but Schumacher turned in sharply and they collided. Both cars were eliminated from the race and, as neither driver scored, Schumacher took the title. The race stewards judged it a racing accident and took no action against either driver, but public opinion is divided over the incident, and Schumacher was vilified in the British media. At the 1997 European Grand Prix at Jerez, the last race of the season, Schumacher led Williams's Jacques Villeneuve by one point in the Drivers' Championship. As Villeneuve attempted to pass Schumacher at the Dry Sac corner on lap 48, Schumacher turned in and the right-front wheel of Schumacher's Ferrari hit the left sidepod of Villeneuve's car. Schumacher retired from the race as a result, but Villeneuve finished in third place, taking four points and so becoming the World Champion. The race stewards did not initially award any penalty, but two weeks after the race Schumacher was disqualified from the entire 1997 Drivers' Championship after an FIA disciplinary hearing found that his "manoeuvre was an instinctive reaction and although deliberate not made with malice or premeditation. It was a serious error." Schumacher accepted the decision and admitted having made a mistake. Schumacher's actions were widely condemned in British, German, and Italian newspapers. This made Schumacher the only driver in the history of the sport, as of 2019, to be disqualified from a Drivers' World Championship. Historically, team orders have always been an accepted part of Formula One. However, in the final metres of the 2002 Austrian Grand Prix, Schumacher's teammate, Rubens Barrichello, slowed his car under orders from Ferrari to allow Schumacher to pass and win the race. Although the switching of positions did not break any actual sporting or technical regulation, it angered fans and it was claimed that the team's actions showed a lack of sportsmanship and respect to the spectators. Many argued that Schumacher did not need to be "given" wins in only the 6th race of the season, particularly given that he had already won four of the previous five Grands Prix, and that Barrichello had dominated the race weekend up to that point. At the podium ceremony, Schumacher pushed Barrichello onto the top step, and for this disturbance, the Ferrari team incurred a US$1 million fine. Later in the season at the end of the 2002 United States Grand Prix, Schumacher slowed down within sight of the finishing line, allowing Barrichello to win by 0.011 seconds, the 2nd closest margin in F1 history. Schumacher's explanation varied between it being him "returning the favour" for Austria (now that Schumacher's title was secure), or trying to engineer a dead-heat (a feat derided as near-impossible in a sport where timings are taken to within a thousandth of a second). The FIA subsequently banned "team orders which interfere with the race result", but the ban was lifted for the 2011 season because the ruling was difficult to enforce. During his spell in Sauber, in the 1991 Sportscar World Championship, Schumacher was involved in a serious incident with Derek Warwick in that year's 430 km of Nürburgring. While trying to set his flying lap in qualifying, Schumacher encountered Warwick's Jaguar on a slow lap resulting in lost time for Schumacher. As retaliation for being in his way, Schumacher swerved the Sauber into Warwick's car, hitting the Jaguar's nose and front wheel. Enraged by the German's attitude, Warwick drove to the pits and chased a fleeing Schumacher on foot through the Sauber pits. He eventually caught up with Schumacher, and it took intervention from Jochen Mass to prevent Warwick physically assaulting Schumacher. Toward the end of the 2010 Hungarian Grand Prix, Rubens Barrichello attempted to pass Schumacher down the inside on the main straight. Schumacher closed the inside line to force Barrichello onto the outside, but Barrichello persisted on the inside at 180 mph (290 km/h), despite the close proximity of a concrete wall and Schumacher leaving him only inches to spare. Barrichello said "It is the most dangerous thing that I have been through", and "There is not a rule for that, but between ourselves we should take a line, stick to it and that's it." Schumacher said that "Obviously there was space enough to go through. We didn't touch, so I guess I just left enough space for him to come through." Ross Brawn said "at the end of the day he gave him enough space. You can argue that it was marginal, but it was just tough – tough racing." A range of ex-drivers and commentators were highly critical of Schumacher. Although there was no accident, the race steward, the same Derek Warwick of the 1991 Nürburgring incident, wanted to black flag Schumacher since that "would have shown a better example to our young drivers". The Hungaroring incident was ruled to be dangerous and Schumacher received a 10 place grid penalty for the next race. Schumacher accepted the decision, and apologised. In 1994, suspicion of foul play by the Benetton team (who were eventually found to have been responsible for some technical violations over the course of the season) was said to have troubled Ayrton Senna that season. For example, in the words of his then teammate, Damon Hill, Senna had chosen to spend a bit of time at the first corner of the Aida circuit following his retirement from the Pacific Grand Prix. After listening to Schumacher's Benetton B194 as it went past, Senna "concluded that there was, what he regarded, as unusual noises from the engine". The FIA subsequently issued a press release setting out action that it required teams to take before the German Grand Prix, given that various cars were found to have an advanced engine management systems emulating launch and traction control. In 1995, Schumacher and Williams driver David Coulthard were disqualified for fuel irregularities, after a switch to Renault engines and Elf oils. On appeal, both drivers had their results and points reinstated, but both teams lost the points the results would normally have earned in the Constructors' Championship. The 1998 Canadian Grand Prix saw Schumacher accused of dangerous driving when his exit from the pit-lane forced Heinz-Harald Frentzen off the track and into retirement. Despite receiving a 10-second penalty, Schumacher recovered and won the race. During qualifying for the 2006 Monaco Grand Prix Schumacher set the fastest time, but his car stopped in the Rascasse corner on the racing line, leaving the corner partially blocked, while his main contender for the season title, Fernando Alonso, was on his final qualifying lap. Schumacher stated that he simply locked up the wheels going into the corner and that the car then stalled while he attempted to reverse out. Alonso believed he would have been on pole if the incident had not happened, and Schumacher was stripped of pole position by the race stewards and started the race at the back of the grid. In the same qualifying session, Giancarlo Fisichella was similarly found to have blocked David Coulthard from improving his time, but Fisichella was only demoted five places on the grid. At the 2010 Monaco Grand Prix, the safety car was deployed after an accident, involving Karun Chandhok and Jarno Trulli, and pulled into the pits on the last lap. Schumacher passed Alonso before the finish line. Mercedes held that "the combination of the race control messages 'Safety Car in this lap' and 'Track Clear' and the green flags and lights shown by the marshals after safety car line one indicated that the race was not finishing under the safety car and all drivers were free to race. ." However an FIA investigation found Schumacher guilty of breaching Safety Car regulations and awarded him a 20-seconds penalty, which cost him six places. Schumacher's younger brother Ralf is also a racing driver, he competed in Formula One for ten years, starting from 1997 until the end of 2007. Their step-brother Sebastian Stahl has also been a racing driver. In August 1995, Michael married Corinna Betsch. They have two children, a daughter Gina-Marie, born 20 February 1997 and a son Mick, born 22 March 1999. He has always been very protective of his private life and is known to dislike the celebrity spotlight. The family moved to a newly-built mansion near Gland, Switzerland in 2007, covering an area of 650-square-metre (7,000 sq ft) with a private beach on Lake Geneva and featuring an underground garage and petrol station. On 19 January 2019, Michael's son Mick Schumacher was announced as a driver for the Ferrari Driver Academy. Schumacher and his wife own horse ranches in Texas and Switzerland. The family has two dogs – one stray that Corinna fell in love with in Brazil, and an Australian Shepherd named "Ed" whose arrival in the family made headlines. In fact, in 2007, Schumacher personally drove a taxi through the Bavarian town of Coburg to collect the dog and enable the family to make their return flight to Switzerland. Both Schumacher and the taxi driver were reprimanded by local police. One of his main hobbies was horse riding, and he played football for his local team FC Echichens. He has appeared in several charity football games and organised games between Formula One drivers. On 23 June 2003, Schumacher was appointed as an Ambassador-at-Large for the Most Serene Republic of San Marino. Schumacher is a special ambassador to UNESCO and has donated 1.5 million euros to the organization. Additionally, he paid for the construction of a school for poor children and for area improvements in Dakar, Senegal. He supports a hospital for child victims of war in Sarajevo, which specialises in caring for amputees. In Lima, Peru he funded the "Palace for the Poor", a centre for helping homeless street children obtain an education, clothing, food, medical attention, and shelter. He stated his interest in these various efforts was piqued both by his love for children and the fact that these causes had received little attention. While an exact figure for the amount of money he has donated throughout his life is unknown, it is known that in his last four years as a driver, he donated at least $50 million. In 2008, it was revealed that he had donated between $5M and $10M to the William J. Clinton Presidential Center and Park of Bill Clinton. Since his participation in an FIA European road safety campaign, as part of his punishment after the collision at the 1997 European Grand Prix, Schumacher continued to support other campaigns, such as Make Roads Safe, which is led by the FIA Foundation and calls on G8 countries and the UN to recognise global road deaths as a major global health issue. In 2008, Schumacher was the figurehead of an advertising campaign by Bacardi to raise awareness about responsible drinking, with a focus on communicating an international message 'drinking and driving don't mix'. He featured in an advertising campaign for television, cinema and online media, supported by consumer engagements, public relations and digital media across the World. On the eve of the 2002 British Grand Prix, on behalf of Fiat, Schumacher presented a Ferrari 360 Modena to the Indian cricketer Sachin Tendulkar at Silverstone. On 21 June 2009, Schumacher appeared on the BBC's motoring programme Top Gear as the Stig. Presenter Jeremy Clarkson hinted later in the programme that Schumacher was not the regular Stig, and the BBC has since confirmed that this is the case. Schumacher was there on that occasion because Ferrari would not allow anyone else to drive the one-of-a-kind black Ferrari FXX that was featured in the show. During his interview with Clarkson, Schumacher stated that his road cars are a Fiat 500 Abarth, and a Fiat Croma, which is his family car. In 2004, Forbes magazine listed him as the second highest paid athlete in the world. In 2005, Eurobusiness magazine identified Schumacher as the world's first billionaire athlete. His 2004 salary was reported to be around US$80 million. Forbes magazine ranked him 17th in its "The World's Most Powerful Celebrities" list. A significant share of his income came from advertising. For example, Deutsche Vermögensberatung paid him $8 million over three years from 1999 for wearing a 10 by 8 centimetre advertisement on his post-race cap. The deal was extended until 2010. He donated $10 million for aid after the 2004 Indian Ocean earthquake. His donation surpassed that of any other sports person, most sports leagues, many worldwide corporations and even some countries. Schumacher's bodyguard Burkhard Cramer and Cramer's two sons were killed in the tsunami. In 2010, his personal fortune was estimated at £515 million. He reportedly received a salary of £21 million each year from the Mercedes team, plus a further £9 million in endorsements. On 29 December 2013, Schumacher was skiing with his 14-year-old son Mick, descending the Combe de Saulire below the Dent de Burgin above Méribel in the French Alps. While crossing an unsecured off-piste area between Piste Chamois and Piste Mauduit, he fell and hit his head on a rock, sustaining a serious head injury despite wearing a ski helmet. According to his physicians, he would most likely have died if he had not been wearing a helmet. He was airlifted to Grenoble Hospital where he underwent two surgical interventions. Schumacher was put into a medically induced coma because of traumatic brain injury; his doctors reported on 7 March 2014 that his condition was stable. On 4 April 2014, Schumacher's agent reported that he was showing "moments of consciousness" as he was gradually withdrawn from the medically induced coma, adding to reports by relatives of "small encouraging signs" over the preceding month. In mid-June 2014, he was moved from intensive care into a rehabilitation ward. By 16 June 2014, Schumacher had regained consciousness and left Grenoble Hospital for further rehabilitation at the University Hospital (CHUV) in Lausanne, Switzerland. On 9 September 2014, Schumacher left CHUV and was brought back to his home for further rehabilitation. In November 2014, it was reported that Schumacher was "paralysed and in a wheelchair"; he "cannot speak and has memory problems". In a video interview released in May 2015, Schumacher's manager Sabine Kehm said that his condition is slowly improving "considering the severeness of the injury he had". In September 2016, Felix Damm, lawyer for Schumacher, told a German court that his client "cannot walk", in response to false reports from December 2015 in German publication Die Bunte that he could "walk a couple of steps". In December 2016 Schumacher's manager stated that "Michael's health is not a public issue, and so we will continue to make no comment in that regard". In December 2018, it was reported that Schumacher "is not bed-ridden nor is he existing on tubes." Schumacher continues the rehabilitation process in the privacy of his home in Switzerland. Source: Hilton, Christopher (2006). Michael Schumacher: The Whole Story. Haynes. ISBN 1-84425-008-3. ‡ Schumacher was disqualified from the 1997 World Drivers' Championship due to dangerous driving in the European Grand Prix, where he caused an avoidable accident with Jacques Villeneuve. His points tally would have placed him in second place in that year's standings. ^ Record shared with Sebastian Vettel (2013). ^ Record shared with Ayrton Senna, who took eight poles in San Marino, and Lewis Hamilton who got his eighth pole position at the Australian Grand Prix in 2019. ^ Record shared with Sebastian Vettel and Lewis Hamilton although Schumacher did so with fewer total races in the season (2002). ^ Record shared with Kimi Räikkönen (2005 and 2008). ^ Record shared with Alberto Ascari in 1952. Allen, James (1999). Michael Schumacher: Driven to Extremes. Bantam Books. ISBN 978-0-553-81214-5. Allen, James (2007). Edge of Greatness. Headline. ISBN 978-0-7553-1678-6. Collings, Timothy (2004). The Piranha Club. Virgin Books. ISBN 978-0-7535-0965-4. Collings, Timothy (2005). Team Schumacher. Highdown. ISBN 978-1-905156-03-0. Domenjoz, Luc (2002). Michael Schumacher: Rise of a genius. Parragon. ISBN 978-0-7525-9228-2. Henry, Alan (1996). Wheel to Wheel: Great Duels of Formula One Racing. Weidenfeld Nicolson Illustrated. ISBN 978-0-7538-0522-0. Hilton, Christopher (2003). Michael Schumacher: The greatest of all. Haynes. ISBN 978-1-84425-044-8. Hilton, Christopher (2006). Michael Schumacher: The Whole Story. Haynes. ISBN 978-1-84425-008-0. Kehm, Sabine (2003). Michael Schumacher. Driving Force. Random House. ISBN 978-0-09-189435-1. Matchett, Steve (1995). Life in the Fast Lane: The Story of the Benetton Grand Prix Year. London: Weidenfeld and Nicolson. ISBN 978-0-297-81610-2. Matchett, Steve (1999). The Mechanic's Tale: Life in the Pit Lanes of Formula One. Osceola, Wisconsin: MBI Pub. ISBN 978-0-7603-0754-0. Williams, Richard (1999). The Death of Ayrton Senna. Bloomsbury. ISBN 978-0-7475-4495-1. Schumacher had a voice role in the Disney/Pixar film Cars. His character is himself as a Ferrari F430. The French film Asterix and Obelix at the Olympic Games features Schumacher in a cameo role as a chariot driver called Schumix. All race and championship results (1991–2006) are taken from the official Formula 1 website (Formula1.com). ^ Benson, Andrew (12 October 2003). "Who is the greatest ever?". Sport. BBC. Retrieved 30 July 2011. ^ "The final five could all have been No. 1, but only Foyt gets the prize". ESPN. 23 May 2008. Retrieved 18 July 2011. ^ "Formula 1's Greatest Drivers: 2. Michael Schumacher". Autosport. Haymarket Publications. 10 December 2009. Retrieved 10 December 2009. ^ Rice, Simon (12 March 2010). "The ten best Formula One drivers". The Independent. UK: Independent Print Ltd. Retrieved 30 July 2011. ^ Gibson, Sean (25 August 2016). "25 reasons why Michael Schumacher is the greatest F1 driver of all time". The Telegraph. UK: The Telegraph. Retrieved 13 June 2017. ^ "Is Schumacher the greatest driver of all time?". The Guardian. UK: The guardian. 19 October 2006. Retrieved 13 June 2017. ^ "Michael Schumacher – the end of an era". Formula1.com. 10 September 2006. Archived from the original on 29 June 2008. Retrieved 24 October 2006. ^ a b "It's official: Schumi to retire". ITV. 11 September 2006. Archived from the original on 4 October 2006. Retrieved 24 October 2006. ^ "Michael Schumacher to retire from Formula 1 at end of season". BBC Sport. 4 October 2012. Retrieved 4 January 2014. ^ Benson, Andrew (28 May 2006). "Schumacher's chequered history". Sport. BBC. Retrieved 8 November 2006. ^ a b Duff, Alex (10 September 2006). "Schumacher, Seven-Time Champion, to Quit Formula One (Update 1)". Bloomberg. Retrieved 18 January 2007. ^ Mn, Marie Nicollier / A. (17 June 2014). "Neuro-rééducation: Au CHUV, Michael Schumacher recevra des soins de pointe". 24 heures. Retrieved 9 September 2014. ^ a b "Michael Schumacher leaves hospital for recovery at home". News. BBC. 9 September 2014. Retrieved 9 September 2014. ^ a b Coppinger, Mike. "Lawyer refutes report, says Michael Schumacher 'cannot walk' or stand". USA Today. Retrieved 21 September 2016. ^ a b "Michael Schumacher 'cannot walk', German court hears". BBC News. 19 September 2016. Retrieved 21 September 2016. ^ a b Donaldson, Gerald. "Hall of Fame – World Champions: Michael Schumacher". Formula1.com. Archived from the original on 6 October 2017. Retrieved 28 May 2018. ^ Collings, Timothy (2005). Team Schumacher. Highdown. pp. 35–37. ISBN 978-1-905156-03-0. ^ a b c "The Beginning". mschumacher.com. 2006. Retrieved 23 April 2007. ^ a b Domenjoz, Luc (2002). Michael Schumacher : Rise of a genius. Parragon. pp. 10–12, 170–171. ISBN 978-0-7525-9228-2. ^ a b "Michael Schumacher – Master of the F1 Circuit". Auto Racing. Retrieved 12 July 2007. ^ Hilton, Christopher (2003). Michael Schumacher : The greatest of all. Haynes. pp. 131–132. ISBN 978-1-84425-044-8. Hilton has defined a race in wet conditions as "all races where it rained – even if that was a shower". ^ Hardcastle, Jonathon. "Michael Schumacher". Archived from the original on 27 September 2007. Retrieved 12 July 2007. ^ "Schumacher races to victory". BBC Sport. 18 March 2001. Retrieved 24 October 2006. ^ "Alonso ahead of Schumi". News24. 21 October 2006. Archived from the original on 30 September 2007. Retrieved 22 October 2006. ^ Tremayne, David (22 October 2006). "Schuey exit promises many twists and turns". The Independent. UK. Archived from the original on 30 September 2007. Retrieved 22 October 2006. ^ "Schu brought down to earth". ITV. 11 October 2006. Archived from the original on 29 September 2007. Retrieved 14 October 2006. ^ a b c Sapa (11 September 2006). "The greatest driver of all time!". SuperWheels. Archived from the original on 27 September 2006. Retrieved 24 October 2006. ^ Noble, Jonathan (25 September 2006). "Vettel sorry to see 'idol' Schumacher go". Autosport. Retrieved 31 October 2006. ^ "Schumacher retains GPDA position". BBC. 9 June 2006. Retrieved 30 November 2007. ^ "Schumacher tops F1 supporter poll". BBC Sport. 27 September 2006. Retrieved 25 October 2006. ^ Collings, Timothy (2004). The Piranha Club. Virgin Books. p. 17. ISBN 978-0-7535-0965-4. ^ Hilton, Christopher (2006). Michael Schumacher: The whole story. Haynes. pp. 62–66. ISBN 978-1-84425-008-0. ^ Hilton, Christopher (2006). Michael Schumacher: The whole story. Haynes. pp. 67–68. ISBN 978-1-84425-008-0. ^ "1991 Belgian Grand Prix". Results Archive. Formula1.com. Retrieved 24 October 2006. ^ Collings, Timothy (2007). "Welcome to the Piranha Club". The Piranha Club. Virgin Books. ISBN 978-1-85227-907-3. ^ Domenjoz, Luc (2006) . Michael Schumacher : Rise of a genius. Parragon. p. 38. ISBN 978-0-7525-9228-2. ^ Henry, Alan, ed. (1992). Autocourse 1992–93. Hazleton Publishing. p. 50. ISBN 978-0-905138-96-1. ^ Kehm, Sabine (2003). Michael Schumacher. Driving Force. Random House. p. 14. ISBN 978-0-09-189435-1. ^ Domenjoz, Luc (2006) . Michael Schumacher: The Rise of a Genius. Parragon. pp. 44–47. ISBN 978-0-7525-9228-2. ^ Saward, Joe (11 August 1994). "Globetrotter: Rocking the boat". GrandPrix.com. Retrieved 28 August 2008. ^ "A return to racing – Spanish Grand Prix 1994". Formula1.com. 30 April 2003. Retrieved 26 May 2008. ^ Williams, Richard (1999). The Death of Ayrton Senna. Bloomsbury. pp. 177–179. ISBN 978-0-7475-4495-1. ^ Hilton, Christopher (2006). Michael Schumacher: The whole story. Haynes. pp. 118–120. ISBN 978-1-84425-008-0. ^ "Grand Prix Results: Belgian GP, 1994". Grand Prix Encyclopedia. GrandPrix.com. Retrieved 13 May 2006. ^ Hilton, Christopher (2006). Michael Schumacher: The whole story. Haynes. p. 142. ISBN 978-1-84425-008-0. ^ Benson, Andrew (28 May 2006). "Schumacher's chequered history". BBC Sport. Retrieved 15 June 2007. ^ "Today in History - DW.COM". Todayinhistory.de. 13 November 1994. Retrieved 26 November 2015. ^ "Throwback: The 1995 Formula One season in photos". FOX Sports. Retrieved 22 March 2018. ^ Cooper, Steve (August 2007). "McLaren dream team turns into nightmare". Autosport. Vol. 189 no. 6. pp. 6–8. ^ Bewers, Matthew. "Ross Brawn Profile". theScuderia.net. Retrieved 3 January 2008. ^ Baker, Andrew (20 October 2006). "Switch the key to Ferrari revival". London: Telegraph Sport. Retrieved 29 October 2006. ^ George, Patrick. "Remember Michael Schumacher's Incredible First Win For Ferrari?". Jalopnik. Retrieved 22 March 2018. ^ "Schumacher confirms retirement". MSN Cars. 11 September 2006. Archived from the original on 28 September 2007. Retrieved 28 September 2006. ^ "Ferrari: Formula 1's Most Successful Team Enters a New Era". about.com. Retrieved 12 June 2007. ^ Benson, Andrew (18 October 2006). "Schumacher 'made Ferrari great'". BBC Sport. Retrieved 6 November 2006. ^ "Irvine to Ferrari!". GrandPrix.com. 2 October 1995. Retrieved 15 May 2016. ^ a b Benson, Andrew (14 May 2016). "Spanish Grand Prix: Why Michael Schumacher's epic 1996 win matters". BBC Sport. BBC. Archived from the original on 15 May 2016. Retrieved 15 May 2016. ^ "The Best of the Best". Autosport. 1999. Retrieved 5 October 2006. ^ Cours, Magny. "Grand Prix Results: French GP, 1996". grandprix.com. Retrieved 18 April 2007. ^ "Friday Press Conference". GrandPrix.com. 10 October 2003. Archived from the original on 29 September 2007. Retrieved 8 November 2006. ^ "MICHAEL SCHUMACHER: SEVEN TIME WORLD CHAMPION". eMercedesBenz. 25 November 2012. Retrieved 18 January 2014. ^ "Schumacher loses championship runner-up crown". BBC News. 11 November 1997. Retrieved 5 July 2010. ^ a b c "FIA World Motor Sport Council – 11 November 1997" (PDF). FIA. 11 November 1997. Archived from the original (PDF) on 2 November 2006. Retrieved 29 October 2006. ^ a b "Crash was my fault, Coulthard admits". Sydney Morning Herald. Reuters. 7 June 2003. Retrieved 28 September 2006. ^ "Schumacher out of action". GrandPrix.com. 12 July 1999. Retrieved 25 October 2006. ^ "Drivers: Michael Schumacher". grandprix.com. Retrieved 30 November 2006. ^ Donaldson, Gerald. "Hall of Fame – World Champions: Mika Hakkinen". Formula1.com. Archived from the original on 9 February 2018. Retrieved 28 May 2018. ^ "10 Greatest Race Car Drivers of All Time". carophile.org. 7 May 2015. Archived from the original on 9 April 2017. Retrieved 9 April 2017. ^ Benson, Andrew (21 April 2004). "A death that shocked the world". BBC. Retrieved 21 April 2007. ^ "Michael Schumacher's best races – Japanese Grand Prix 2000". BBC Sport. 30 December 2013. Retrieved 22 March 2018. ^ "Grand Prix du Canada – Statistiques". Telus. Archived from the original on 27 September 2007. Retrieved 15 June 2007. ^ "Send your tributes to Schumacher". BBC. 2 September 2001. Retrieved 3 February 2007. ^ a b c "Schumacher steals Austrian win". BBC Sport. 12 May 2002. Retrieved 24 October 2006. ^ "Formula One: Ferrari team-mate hands Schumacher controversial victory". 12 May 2002. ISSN 0307-1235. Retrieved 22 March 2018. ^ Molinaro, John C. (12 September 2006). "Top 10 Michael Schumacher moments". CBC Sports. Canadian Broadcasting Corporation. Retrieved 6 January 2012. ^ "2002 F1 World Championship". Motor Sport Magazine. 3 July 2017. Retrieved 22 March 2018. ^ "Coulthard takes Melbourne thriller". BBC Sport. 9 March 2003. Retrieved 3 November 2006. ^ "Raikkonen claims maiden win". BBC Sport. 23 March 2003. Retrieved 3 November 2006. ^ "Raikkonen wins chaotic race". BBC Sport. 6 April 2003. Retrieved 3 November 2006. ^ "FIA stands by tyre rulings". BBC Sport. 9 September 2006. Retrieved 25 April 2007. ^ "2003 F1 World Championship". Motor Sport Magazine. 3 July 2017. Retrieved 22 March 2018. ^ "A tribute to Michael Schumacher". f1technical.net. 2006. Retrieved 1 December 2007. ^ "FIA announce rule changes for 2005 and 2006". Formula1.com. 22 October 2004. Retrieved 13 April 2007. ^ "Michael Schumacher". f1complete.com. Archived from the original on 12 October 2007. Retrieved 30 November 2007. ^ "Alonso holds off Schumacher surge". BBC Sport. 24 April 2005. Retrieved 3 November 2006. ^ Henry, Alan (27 July 2005). "Alonso within touching distance of title". The Guardian. London. Retrieved 5 November 2006. ^ "Schumacher takes hollow USGP victory". Crash.net. 19 June 2005. Archived from the original on 30 June 2008. Retrieved 19 June 2007. ^ "2005 F1 World Championship". Motor Sport Magazine. 3 July 2017. Retrieved 22 March 2018. ^ "Unbeatable Schumi sets new pole record". GPUpdate.net. 22 April 2006. ^ "Alonso's Renault Engine blew in spectacular fashion". Motorsport.com. 10 September 2006. Archived from the original on 30 September 2007. Retrieved 1 August 2007. ^ a b Zanca, Salvatore (1 October 2006). "Alonso has trouble with his front tires". The Washington Post. Retrieved 1 August 2007. ^ Henry, Alan (9 October 2006). "Formula One: Engine failure ruins Schumacher's dream". the Guardian. Retrieved 22 March 2018. ^ "Schumacher concedes title to Alonso". BBC Sport. 8 October 2006. ^ "Pele to present a trophy to Schumacher". International Herald Tribune. 22 October 2006. Retrieved 1 August 2007. ^ "Schumacher honored by a presentation from Pele". International Herald Tribune. 22 October 2006. Retrieved 1 August 2007. ^ "Schumacher suffers in qualifying". BBC Sport. 21 October 2006. Retrieved 1 August 2007. ^ "Fisi did cause Schu puncture". itv.com/f1. 23 October 2006. Archived from the original on 29 September 2007. Retrieved 23 October 2006. ^ "Superb Schumi signs off in style". BBC Sport. 22 October 2006. Retrieved 3 November 2006. ^ "Brazil: Alonso takes championship, but Michael steals the show". ManipeF1. 22 October 2006. Archived from the original on 10 May 2007. Retrieved 3 November 2006. ^ "2006 Brazil Grand Prix Report". PitPass. Retrieved 3 November 2006. ^ "Michael Schumacher will retire from race driving at the end of the 2006 World Championship" (PDF) (Press release). Ferrari S.p.A. 10 September 2006. Retrieved 24 October 2006. ^ "New role for Schumacher at Ferrari?". PitPass. 29 October 2006. Retrieved 29 October 2006. ^ "Tributes to Schumi". BBC Sport. 22 October 2006. Retrieved 24 October 2006. ^ Evans, Simon (11 September 2006). "Italy shows gratitude to Schumacher". Autosport. Retrieved 12 September 2006. ^ Goren, Biranit; Lostia, Michele (25 October 2007). "Schumacher in the F2007 for the first time". Autosport. Haymarket Publications. Retrieved 31 January 2009. ^ "Schumacher to help Ferrari select drivers". Autosport. 29 October 2007. Retrieved 30 November 2007. ^ Elizalde, Pablo. "Schumacher stays on top in Barcelona – F1 – Autosport". Autosport.com. Retrieved 22 March 2018. ^ "Schumi in charge of developing cars". Gazzetta dello Sport via f1technical.net. 11 January 2008. Retrieved 11 January 2008. ^ Schumacher slips up in Superbike race www.itv-f1.com[permanent dead link]. Retrieved 5 July 2008. ^ "Manager rules out Schumi F1 return". F1 ITV. 28 July 2009. Archived from the original on 31 July 2009. Retrieved 29 July 2009. ^ "Michael happy to help". Michael Schumacher – Official Website. Retrieved 8 August 2009. ^ "Lealdade custa caro: Schumi ganhará cerca de R$ 8,5 milhões por corrida" (in Portuguese). Globo. 29 July 2009. Archived from the original on 2 August 2009. Retrieved 30 July 2009. ^ "Williams against Schumacher Ferrari test". GPUpdate.net. 3 August 2009. Retrieved 1 February 2011. ^ "Red Bull echoes Williams's Ferrari sentiments". GPUpdate.net. 4 August 2009. Retrieved 1 February 2011. ^ "Schumacher cancels F1 return". carthuasiast.com. Archived from the original on 14 August 2009. Retrieved 12 August 2009. ^ Noble, Jonathan (3 September 2009). "Fisichella: Ferrari drive a dream for me". autosport.com. Haymarket Publishing. Retrieved 27 November 2016. ^ "Schumacher at 50 - plans to honour a sporting icon". RTE.ie. 27 December 2018. ^ a b c d e "Michael Schumacher signs up for F1 return with Mercedes". BBC Sport. 23 December 2009. Retrieved 23 December 2009. ^ Musolino, Adrian (24 December 2009). "Schumacher returns for a legacy or misery". The Roar. Retrieved 24 December 2009. ^ "Schumacher is 'past it' – Moss". ESPN F1. 27 April 2010. Retrieved 25 August 2011. ^ "Damon Hill: Never, Ever, Ever, Ever Write Off Schumacher". The Black Stuff. The Media Halls. 8 July 2010. Archived from the original on 31 March 2012. Retrieved 25 August 2011. ^ "Will chassis upgrade solve Schumacher woes?". Inside F1, inc. 3 May 2010. Retrieved 27 May 2010. ^ "Schumacher's car designed for me – Button". WorldCarFans. Black Falcon Media Group. 28 July 2010. Retrieved 13 December 2010. ^ "FIA To Clarify Safety Car Regulations". GrandPrix.com. 20 May 2010. Retrieved 27 May 2010. ^ Young, Byron (27 June 2010). "Michael Schumacher blasts Valencia Grand Prix stewards". Daily Mirror. UK. Retrieved 15 November 2010. ^ "Schumacher escapes unhurt from crash at Abu Dhabi". USA Today. David Hunke; Gannett Company. Associated Press. 14 November 2010. Retrieved 20 November 2010. ^ "Lucky escape for Michael Schumacher after crash with Vitantonio Liuzzi". The Daily Telegraph. UK. 14 November 2010. Retrieved 20 November 2010. ^ Strang, Simon (14 November 2010). "Schumacher says crash was frightening". Autosport. Haymarket Publications. Retrieved 14 November 2010. ^ "2011 Canadian GP review: Button bounces back to win". F1 Fanatic. 12 June 2011. Retrieved 25 January 2017. ^ Sheringham, Sam (9 October 2011). "Japanese Grand Prix as it happened". BBC Sport. BBC. Retrieved 10 October 2011. Lap 40: This is the first time Schuey has led a race since the Japanese GP in 2006. ^ "Michael Schumacher the greatest F1 driver of all time". ABC News. 30 December 2013. Retrieved 25 January 2017. ^ "2011 F1 Results & Standings Schedule | F1-Fansite.com". F1-Fansite.com. Retrieved 25 January 2017. ^ "Schumacher could stay in F1 after 2012". ESPN F1. 27 January 2010. Retrieved 25 July 2010. ^ "Brawn upbeat despite Melbourne failure". Google News. Press Association. 18 March 2012. Retrieved 18 March 2012. ^ "Michael Schumacher's retirement at Chinese Grand Prix – What exactly happens when a wheel nut is loose?". 19 April 2012. Retrieved 22 March 2018. ^ Cary, Tom (26 May 2012). "Monaco Grand Prix 2012: grid penalty denies Michael Schumacher of pole as Mark Webber leads the line". ISSN 0307-1235. Retrieved 22 March 2018. ^ Sport, Telegraph (27 May 2012). "Monaco Grand Prix 2012: bittersweet weekend for Mercedes as Rosberg shines and Schumacher's bad luck continues". ISSN 0307-1235. Retrieved 22 March 2018. ^ "Conclusions from the German GP". Sky Sports. BSkyB. 23 July 2012. Archived from the original on 26 July 2012. Retrieved 24 July 2012. ^ Noble, Jonathan (28 September 2012). "Schumacher's indecision prompted Mercedes to chase Hamilton". Autosport. Haymarket Publications. Retrieved 16 October 2012. ^ "Schumacher announces Formula One retirement". Formula One Administration. 4 October 2012. Retrieved 4 October 2012. ^ "Schumacher Ready To Go 'Home' After Retirement". Speed. Speed Channel, Inc. GMM. 14 October 2012. Archived from the original on 15 October 2012. Retrieved 16 October 2012. ^ "2012 Driver Standings". Formula1.com. Retrieved 5 November 2017. ^ "Even a tank can't halt schu now". JEC Composites. Archived from the original on 8 January 2007. Retrieved 8 November 2006. ^ "Michael Schumacher Helmet Profile". theprancinghorse.co.uk. Archived from the original on 30 December 2006. Retrieved 10 February 2007. 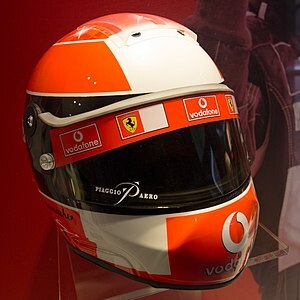 ^ "Gallery: Michael Schumacher's F1 helmets". Motorsport.com. Archived from the original on 23 March 2018. Retrieved 22 March 2018. ^ "Michael Schumacher Biography". mschumacher.com. Retrieved 25 October 2006. ^ "Michael's winning helmet". PitPass. 21 October 2006. Retrieved 7 November 2006. ^ Noble, Jonathan (29 August 2011). "Behind the scenes at Spa". Autosport. Haymarket Publications. Retrieved 30 August 2011. Helmet supplier Schuberth provided him with a special 21-carat gold plated helmet, which he wore as a special one-off for the weekend. ^ "Michael Schumacher 2012 300TH GP Commemorative F1 Replic". www.cmhelmets.com. ^ "Michael Schumacher UNESCO Champion for sport". UNESCO. April 2002. Archived from the original on 24 October 2008. ^ "Michael Schumacher". Laureus. Laureus World Sport Awards Limited. 2006. Archived from the original on 28 September 2007. Retrieved 18 April 2007. ^ "Winners". Retrieved 11 August 2015. ^ "Schumacher honoured by the FIA". Formula1.com. 11 December 2006. Retrieved 15 December 2006. ^ "Schumacher honoured by having a corner named after him at Nurburgring". Formula One. 21 July 2007. Retrieved 21 July 2007. ^ "Michael Schumacher honours team Germany's A1GP success". f1.automoto365.com. A1GP. 1 May 2007. Archived from the original on 27 September 2007. Retrieved 7 May 2007. ^ "Prince of Asturias Awards' Michael Schumacher page". Archived from the original on 25 July 2008. ^ "Asturias Jury report". Fundación Princesa de Asturias. 5 September 2007. Archived from the original on 24 July 2008. ^ "Schumacher becomes Swiss football ambassador". GPUpdate.net. 16 April 2007. Retrieved 1 February 2011. ^ "Légion d'honneur for Shumacher". The Voice of Russia. 30 April 2010. Archived from the original on 16 July 2011. Retrieved 3 May 2010. ^ "Ariana Grande, U2 Among Winners at 2014 Bambi Awards". U2 Station. 14 November 2014. Retrieved 15 November 2014. ^ a b Kopu, Ville; Nottmeier, Jan. "Schumacher 500: Has the King Lost His Crown?". Autosport. Retrieved 24 October 2006. ^ "Classic F1 – Australian Grand Prix 1994". BBC. 23 March 2009. Retrieved 24 March 2009. Coverage of the collision occurs between 02:14 and 03:30. ^ a b Molinaro, John F. (12 September 2006). "Top 10 Michael Schumacher Moments". CBC Sports. Retrieved 3 November 2006. ^ Henry, Alan (1998) . Wheel to Wheel: Great Duels of Formula One Racing. Weidenfeld Nicolson Illustrated. p. 117. ISBN 978-0-7538-0522-0. ^ "Now we are 76...: Murray Walker". grandprix.com. 18 October 1999. Archived from the original on 3 December 2007. Retrieved 30 November 2007. ^ "Schumacher loses championship runner-up crown". BBC News. 11 November 1997. Retrieved 24 October 2006. ^ a b "The lost honor of Michael Schumacher". GrandPrix.com. 3 November 1997. Retrieved 24 October 2006. ^ "Calling time on a career". itv-f1.com. Archived from the original on 14 March 2008. Retrieved 15 December 2007. ^ "Record fine for Turks". Reuters. Retrieved 24 October 2006. ^ Legard, Jonathan (30 September 2002). "Ferrari's own goal". BBC Sport. BBC. Retrieved 28 February 2009. ^ Wade, Stephen (28 October 2002). "Formula One closes door on team orders". USA Today. Retrieved 28 October 2006. ^ "F1 Commission declaration" (Press release). FIA. 28 October 2002. Archived from the original on 26 March 2007. Retrieved 30 October 2006. ^ "F1 chiefs drop the ban on team orders in new rules". BBC Sport. 10 December 2010. Retrieved 27 January 2011. ^ Watkins, Gary (February 2005). "Schumacher at Sauber". Autosport. Retrieved 17 December 2012. ^ Rae, Richard (1 August 2010). "Schumacher punished for dangerous move on Barrichello". BBC Sport. Retrieved 2 August 2010. ^ "Michael Schumacher defended by Ross Brawn after Rubens Barrichello near-miss". The Daily Telegraph. UK. 2 August 2010. Retrieved 27 January 2011. ^ "Schumacher apologises to Barrichello". ESPN F1. 2 August 2010. Retrieved 27 January 2011. ^ "Rubens fumes at 'dangerous' Schumacher move". ESPN F1. 1 August 2010. Retrieved 27 January 2011. ^ "Mercedes GP leave Budapest empty handed". F1Technical.net. 1 August 2010. Retrieved 27 January 2011. ^ "Schumacher lucky not to be disqualified – Warwick". ESPN. 3 August 2010. Retrieved 17 December 2012. ^ The Last Teammate (1994 San Marino Grand Prix's 20th Anniversary documentary) @ 8'25". SkySportsF1. Archived from the original on 3 May 2014. Retrieved 2 May 2014. ^ "Interview with Max Mosley". 8 May 1994. Retrieved 14 November 2015. ^ "Engine management software FIA press release". 8 May 1994. Retrieved 14 November 2015. ^ "Exclusion of Car No.1 (Schumacher/Benetton) and Car No. 6 (Coulthard/Williams) from the results of the Brazilian Grand Prix" (PDF). FIA. 29 March 1995. Archived from the original (PDF) on 2 March 2005. Retrieved 22 October 2012. ^ Henry, Alan (December 1995) . "1995 Grands Prix: Brazilian Grand Prix". Autocourse 1995–96. Hazleton Publishing. p. 90. ISBN 978-1-874557-36-4. ^ "1998 Canadian Grand Prix". grandprix.com. Retrieved 1 July 2009. ^ "British Grand Prix Review". Autosport. Retrieved 24 October 2006. ^ a b "Schumacher is stripped of pole". Formula1.com. 27 May 2006. Archived from the original on 22 July 2010. Retrieved 24 October 2006. ^ "Post-qualifying press conference – Monaco". Formula1.com. 27 May 2006. Archived from the original on 6 September 2006. Retrieved 24 October 2006. ^ "Fisichella punished by stewards". Formula One official site. 27 May 2006. Archived from the original on 19 October 2006. ^ "Mercedes rule out appeal against Schumacher penalty". BBC Sport. 18 May 2010. Retrieved 27 January 2011. ^ "Schumacher half-brother looking for racing action". Granprix.com. 20 November 2001. Retrieved 19 December 2008. ^ "Michael and Corinna Schumacher". December 2013. Retrieved 11 December 2013. ^ Holt, Sarah (22 October 2006). "Who is the real Schumacher?". BBC Sport. Retrieved 22 October 2006. ^ "Schuey vrooms into £30m home". The Sun. 30 November 2007. Retrieved 3 November 2008. ^ "Mick Schumacher joins the FDA". 19 January 2019. Retrieved 29 January 2019. ^ "home :: CS Ranch". cs-ranch.com. Retrieved 7 April 2017. ^ "Home :: CS Ranch". cs-ranch.eu. Retrieved 7 April 2017. ^ "Taxi for Schumacher". BBC Sport. 12 December 2007. Retrieved 12 December 2007. ^ "Police fuming over Schumacher's taxi race". Agence France-Presse. 15 December 2007. Retrieved 30 March 2008. ^ "FIFA Fair Play: Playing for a better world". FIFA. 16 December 2004. Archived from the original on 18 September 2006. Retrieved 25 October 2006. ^ "Thoughts on Schumacher". BBC Sport. 10 September 2006. Retrieved 25 October 2006. ^ "Diplomatic and Consular Representations of San Marino at large". Secretary of State for Foreign and Political Affairs. Retrieved 17 March 2010. ^ "Schumacher appointed ambassador of San Marino". Motorsport.com. 2 September 2003. Archived from the original on 6 June 2011. Retrieved 17 March 2010. ^ "Michael Schumacher, a UNESCO champion". UNESCO. 2002. Archived from the original on 21 February 2007. Retrieved 25 October 2006. ^ "Clinton Foundation Donors". The Wall Street Journal. 18 December 2008. Retrieved 18 December 2008. ^ Sweney, Mark (4 July 2008). "Schumacher puts the brakes on drink-driving". The Guardian. London. Retrieved 30 January 2009. ^ "When Schumacher met Sachin!". Rediff Cricket Online. 23 July 2002. Retrieved 24 July 2002. ^ "Schumacher 'revealed' as the Stig". BBC Online. 21 June 2009. Retrieved 22 June 2009. ^ "F1 : Schumacher completes a stint as Top Gear Stig - SCHUMACHER - F1-Live.com". En.f1-live.com. Retrieved 8 August 2009. ^ "Series 13, Episode 1". Top Gear. 12 June 2009. BBC Two. ^ "The Best-Paid Athletes". Forbes. 24 June 2004. Retrieved 8 August 2009. ^ Reid, Angus (11 July 2006). "Sports: How Big Is Too Big?". Mediacheck. thetyee.ca. Retrieved 24 October 2006. Forbes magazine has not yet included him on its billionaires list. More recently, other sources have estimated his net worth in 2006 somewhat lower, www.f1i.com reported that it 'surpassed $800M'. "Retired Schu to earn $26 m in 2007 – report". f1i.com. 18 September 2006. Archived from the original on 6 May 2007. Retrieved 23 January 2007. ^ "The Celebrity 100". Forbes. 2005. Retrieved 25 October 2006. ^ "MOT: Schumacher slaps $11.9 m price on his head". AAP Sports News. 11 November 1999. Archived from the original on 16 May 2011. Retrieved 24 October 2006. ^ "Schumacher's sponsor extends contract". GPUpdate.net. 31 August 2005. Retrieved 1 February 2011. ^ "Schumacher donates $10 m relief aid". CNN. 4 January 2005. Retrieved 24 October 2006. ^ McAllister, Mike (11 November 2005). "My Sportsman: Michael Schumacher". 2005 Sportsman of the Year. Retrieved 25 October 2006. ^ "Schumacher's bodyguard died in tsunami". Retrieved 9 September 2014. ^ "Drivers top the rich list". ESPN F1. Retrieved 9 September 2014. ^ McEvoy, Jonathan (26 March 2010). "The £30m man: Michael Schumacher leaves his rivals in the shade with mega pay deal". Daily Mail. UK. Retrieved 7 April 2010. ^ "Michael Schumacher's Skiing Accident in Méribel – Locations". X10. Archived from the original on 24 February 2014. Retrieved 24 February 2014. ^ "Schumacher Head Injury Skiing". Snow Industry News. Archived from the original on 27 April 2015. Retrieved 20 April 2015. ^ Noble, Jonathan (30 December 2013). "Helmet helped protect Michael Schumacher in skiing accident". Autosport. Haymarket Publishing. Retrieved 30 December 2013. ^ Whaling, James (26 November 2017). "What we know about Michael Schumacher after horror ski accident". mirror. Retrieved 18 December 2017. ^ "Michael Schumacher 'still in wake-up phase'". CNN. 7 March 2014. Retrieved 16 March 2014. ^ Noble, Jonathan (30 December 2013). "Doctors say Michael Schumacher's condition 'extremely serious'". Autosport. Haymarket Publishing. Retrieved 30 December 2013. ^ "Schumacher has 'conscious moments' – agent". BBC News. 4 April 2014. Retrieved 4 April 2014. ^ Schmuck, Pascal; Nicollier, Marie (16 June 2014). "Schumacher entre les mains des neurologues du CHUV". 24 Heures (in French). Retrieved 21 August 2014. ^ Williams, Alexandra (19 November 2014). "Michael Schumacher: 'paralysed and in a wheelchair'". The Telegraph. Retrieved 19 November 2014. ^ Manalo, Komfie (26 May 2015). "Michael Schumacher Latest Health Update: F1 Racing Superstar Improving 17 Months After Ski Accident". Retrieved 27 May 2015. ^ "Michael Schumacher's health to remain a private matter, says manager Sabine Kehm". The Telegraph. Telegraph Media Group Limited. 17 December 2016. Retrieved 24 December 2018. ^ "Most total wins". ESPN. Retrieved 13 May 2015. ^ "Most wins with 1 team". Stats F1. Retrieved 13 May 2015. ^ "Most second places". Stats F1. Retrieved 26 August 2017. ^ "5 hat tricks in a season". ESPN. Retrieved 13 May 2015.